Credit Cards will be charged the full balance for cancellation prior to 7 days of arrival date and also for NON SHOW or reduction in numbers. Cancellation must be made 7 days prior to the arrival date,otherwise full payment will be charged,also for NON SHOW full charge for the reservation will be charged. Security Deposit of 30% will be charged at reservation and balance on arrival at the Hotel. Please note that if cancellation is done prior the 7 days Full Deposit will be Refund. For groups that have small children, we must be informed of the spcific age so we can make the appropriate arrangements for them. 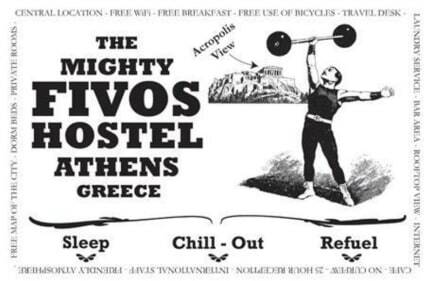 Located right under the Acropolis Rock and just 50 metres from Monastiraki Train Station (Direct access to port and Airport) Hostel Fivos is an centrally located haven for travellers in the heart of the old city. Cheap, clean rooms, air-conditioning, central heating, Free breakfast and wifi in rooms, and a roof terrace with views of the Acropolis. We also provide laundry, internet cafe and have an in house travel agency services offering you some of the lowest rates on all inclusive packages to the Greek Island and mainland Greece. You can also save extra money by taking advantage of our snack bar which offers very affordable meals. All Major archaeological sites like Hadrian's Library, the Tower of the Winds, Thission, and the ancient Kerameikos Cemetary and a sort walk from us and the Acropolis itself lies a mere 20 minutes away by foot. You can lose yourself in the cobbled streets of Plaka for some good food and traditional Greek dancing, hunt for souvenirs in Monastiraki, see Athens' main shopping parade, Ermou St, and go for drinks in Psirri, the nightlife spot in Athens. A great budget place just off Monastiraki square and metro station in the very center of Athens. Walk to the Akropolis, and to Plaka. No kitchen for guests, but there are countless eateries nearby. It seems that the entire city eats all its meals out! Not a conventional hostel, rather a converted older hotel. Quiet, ideal for mature people. Clean! Want to party? Just walk around the neighborhood! Good breakfast! I extended my stay here. Probably the friendliest and most helpful staff tat I've encountered in any hostel, were happy to go out of their way to help out in any way they could. 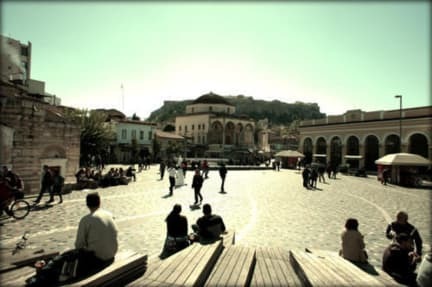 Perfect location in Monastiraki Square, a somewhat touristy area with plenty of food options, shopping, markets, street performances and historical landmarks. The Acropolis is a short walk away and is visible the second you walk out of the building. Rooms are minimal but clean and well-maintained. Really nice rooms in a great central area. The staff are really helpful. Good location, clean, safe and close to Athens sites and metro. A wee bit noisy on the street side of the hostel from traffic. Earplugs are helpful as usual. Breakfast was very good, coffee very bad. Very well located, very business-like hos/tel with an excellent breakfast. If you want to hang at the Acropolis, I'd recommend it as long as you aren't expecting a party at the place itself. Just great as a quiet base on a budget while the party itself is outside! Awesome location, really can't imagine a more central spot. Breakfast was great too. Sheets were changed every day, and you get a towel! One thing.. it is a very quiet hostel atmosphere, if you are traveling solo don't expect to be very social here. I arrived and got a room which smelled like cigarette smoke. It was clean and the A/C worked, but it simply smelled. I explained this to the staff and they immediately switched my room. The new room was better, but the A/C did not work. I was tired and did not want to be a bother, so I kept it. They should really update the A/C's. With that said, you are paying for the location!! Easy to come and go on the rail from the airport. Close to pretty much anything in Athens you need. This hostel is more like a lower class hotel. Facilities are fine. Breakfast is good and is included. Reminder: Strick cancellation policy so don't look for any sympathy, even when the ports are closed and its impossible to make the reservation on time even with two days notice, as was the case in my stay (hurricane). Nicely located but not recommended for women or those under 40 years of age.